Lighting A Revolution: Ink Blotter 178, "My doctor said...."
Blotter number 178; image number: LAR_B178. With the EDISON MAZDA lamp." The convenience and (eventually) the economy of electric light led to far-reaching changes in American homes. People gained more control over their time and over the use of interior spaces. 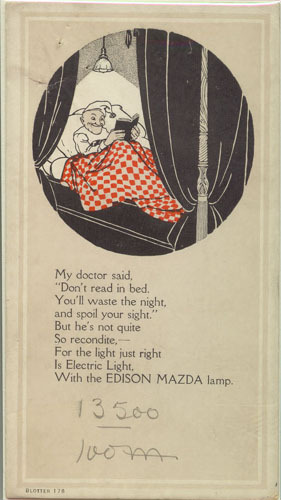 Rather than sleeping, one could stay awake and "waste the night" by reading in bed, as in this blotter for Edison Mazda lamps. Though some modern researchers studying sleep-deprivation might argue that the gentleman's doctor gave good advice. Electricity solved some problems of lighting a bedroom and also raised a few concerns. Light sources that used an open flame such as candles and gas lamps were a fire hazard. No-one needed to fumble with matches to light an electric lamp in the middle of the night. Electric lamp makers printed lists of deaths attributed to gas light (often, it was suggested, due to the victim's failure to turn off the gas valve after blowing out the flame) in their advertising. The new technology made some people nervous. Unused to electricity, they wondered about the safety of sleeping in an electrified room. Salespeople reported receiving questions asking if the electricity could leak out like gas. If one went to sleep with the lights on, would the room catch fire? Hotel owners were especially concerned in the late 19th century about operational safety issues for guests using electric lights for the first time. The handwritten notation "13500 / 100M" on this blotter is a counting mark, not a museum marking. Apparently 100,000 blotters of this type were ordered. 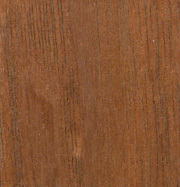 As the blotters were packed for shipment, this blotter happened to be on top of one stack and became number 13,500 in the print-run. Edison Illuminating Company "Hotel Lighting" catalog, c1895.